Yesterday, i came back from the market with my freshly brought periwinkles. For a moment, i thought they were all dead till i came back to the kitchen to find them everywhere on the kitchen walls. The actual thought that the main ingredient for my Okazi soup was crawling away sent shivers down my spine. It took me almost an hour to get every single one that crept away back in place. From that moment, i vowed never to leave periwinkles by themselves Unguarded (Kitchen Tip no 1...lol!). 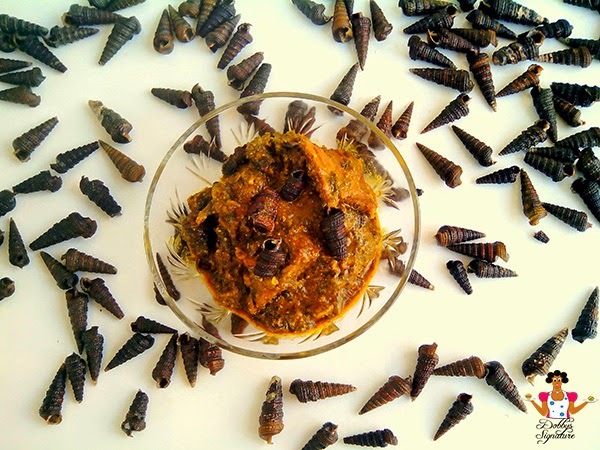 Ofe Ukazi "Igbo" or Afang Soup "Efik" is a tasty Nigerian soup which is quite popular in the Eastern & south eastern (Cross river....Akwa ibom) parts of Nigeria. 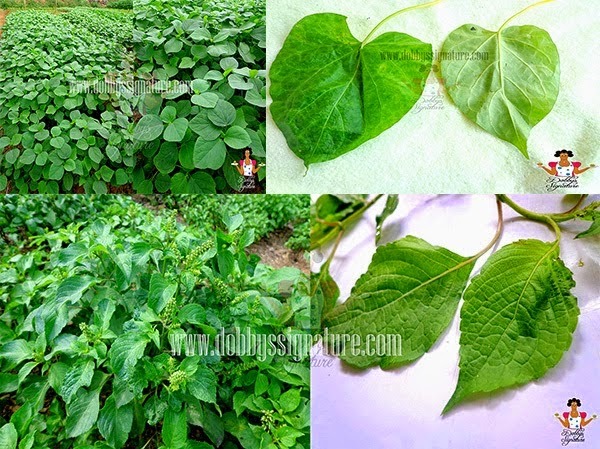 The major ingredient which the name of the soup was coined from is the wild spinach leaf (Ukazi/Afang leaf) "Gnetum Africanum" (View full list of Nigerian leafy vegetables here). It's got a tough (hard) papery glossy texture and is tasteless without any distinctive smell until cooked. Due to it's tough texture, its usually sold pre-sliced in the Nigerian market by the vendors. Sometimes after it's sliced, it's further ground with a dry mill as this tends to bring out the taste more in soups. 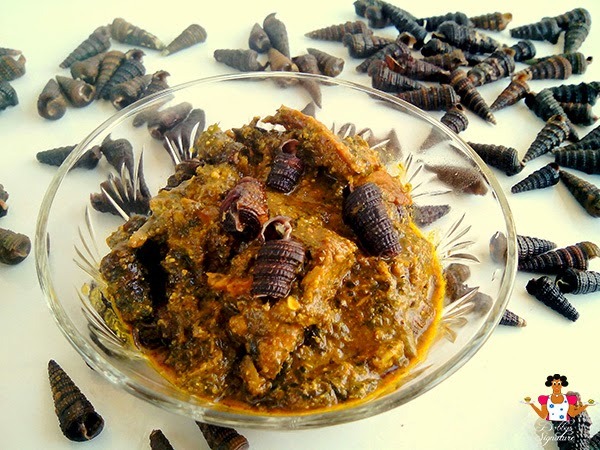 The igbos prepare Ofe Ukazi in two ways; With Egusi Or With Achi which serves as the soup thickener. 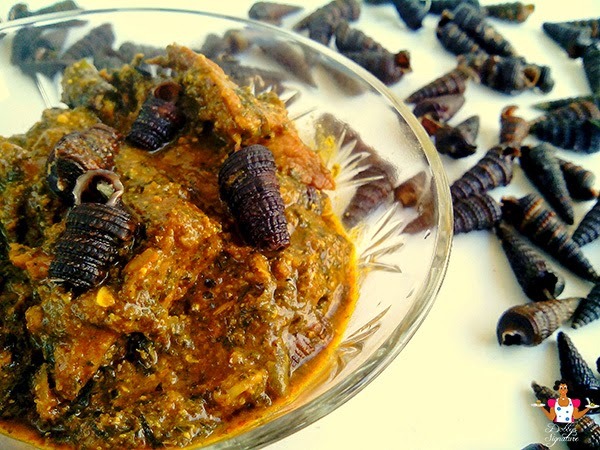 Usually when it's being prepared with Egusi, Achi wouldn't be added as egusi serves as a good thickener. Also, When prepared with Achi, some igbos (Especially those in the riverine areas) prefer Grinding the Okazi leaves a little bit more after Slicing. This helps in bringing out the real taste of the soup. Similarly, the Efiks prepare Afang soup slightly different from the Igbo version. For afang, Waterleaf is usually substituted for Achi or Egusi (Just like edikaikong). Also, The Efiks grind the okazi leaves further after slicing. Step 1: To prepare the Okazi leaves, you'd have to choose between Grinding, pounding or leaving the leaves like that. The consistency of the ground okazi soup is usually thick. If you intend using it like that, simply wash the sliced leaves and set aside. If you want to pound, wash and place the leaves in a mortar and pound with a pestle till it breaks up further. You can also grind the leaves at home or with a commercial mill in the market (This is usually done with a little bit of crayfish to make it grind smoothly). - Set this aside. Step 2: Grind the Achi with a dry mill and set aside. Step 3: For this meal, i used shelled periwinkles "Mfi/isam". You could either use the shelled or un-shelled type. To prepare, wash the shelled periwinkles thoroughly to remove the mud. Chop off the sharp edge of the Isam/ Mfi with a Knife or pincer as shown in the pic below, Rinse clean and set aside. Step 4: Wash the Beef, Stockfish, Dryfish and place in a small pot. Add the ,Seasoning cubes, Salt, ground pepper and Onions. Add a little water, just enough to cover the contents of the pot and cook for about 15 mins till tender. At this point, add more water into the cooked meat. This would serve as a base for the soup. Kitchen Tip: To reduce stress, you could add onion and pepper whole so that once the stock is done, they could easily be removed before the real soup preparation. This doesn't prevent it from giving you the needed flavor and basic nutritional benefits. 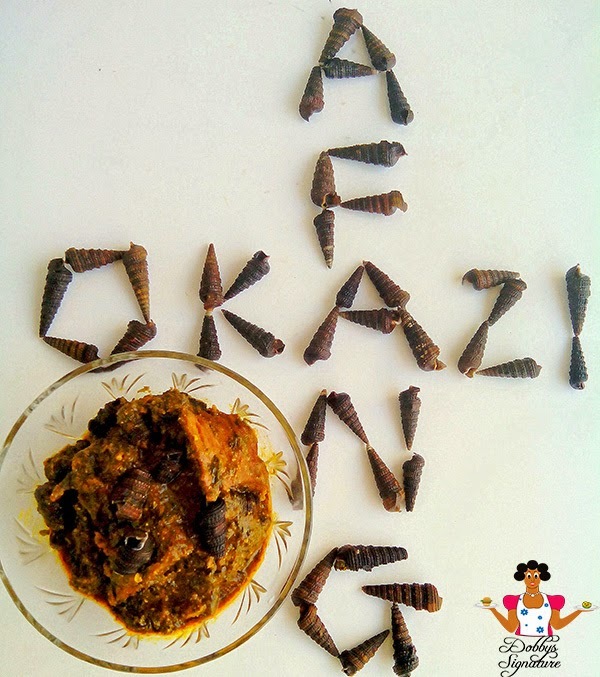 Step 7: Add the ground or sliced Okazi/ Afang (if cooking Afang, mix the afang leaves with chopped waterleaves). Leave to cook futher for 12-15mins more. Never knew that you culd use periwinkle for Okazi soup,will try it out. Dobby won't kill me with her recipes. I'm definitely going to try this out. Thank you for this. Nkwobi - fair, ofe utazi - great, ofe nsala - great, jollof spag - good flaw: excess oil. Thanks to your site, am turning into confirmed chef! Thanks for the status report fab Melody, with time and Hopefully the ratings for Nkwobi and Jollof spaghetti would improve :D.
Hello Dobby, grt job you are doing here, do kip it up. i ll like to know if pounded cocoyam can be used as a thickener instead of the achi? Or OFE ONUGBU (Bitter leaf soup). You can Use "offor" instead of "Achi" for this recipe. No you can't use baking flour as a thickener for this. Can a blender bbe used to grind the leaves instea of a commercial mill? sure you can use a blender to grind it instead. You can cook it like that without Achi. Calabar people make theirs without it. 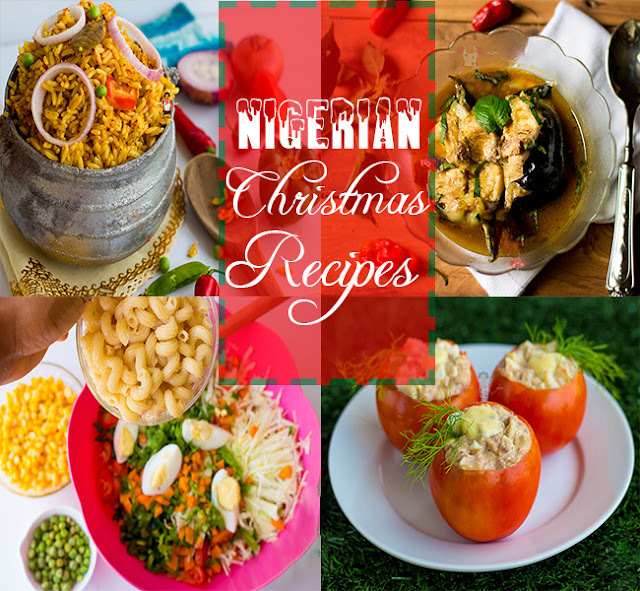 Other options include Cocoyam (ede ofe) or Offor. Thanks Anon! Glad to have you here.